After 7 years of engaging with their Customers on AirlineComplaints.org, Etihad's account expired on December 1, 2015 but remained active while we discussed their renewal. After almost a month of discussions, Etihad decided to stop engaging its customers here and to not renew their account, so their account was suspended on December 29, 2015. Less than 2 hours after their suspension, we noticed a new account with username "MyWindowToTheWorld" replying to an Etihad customer and posting the Etihad customer service e-mail address while claiming to be another passenger in a similar situation and mentioning the Etihad account suspension (possibly to put pressure on our team to unsuspend the Etihad account). Our team naturally found this quite suspicious so soon after Etihad's suspension, so we decided to dig deeper. 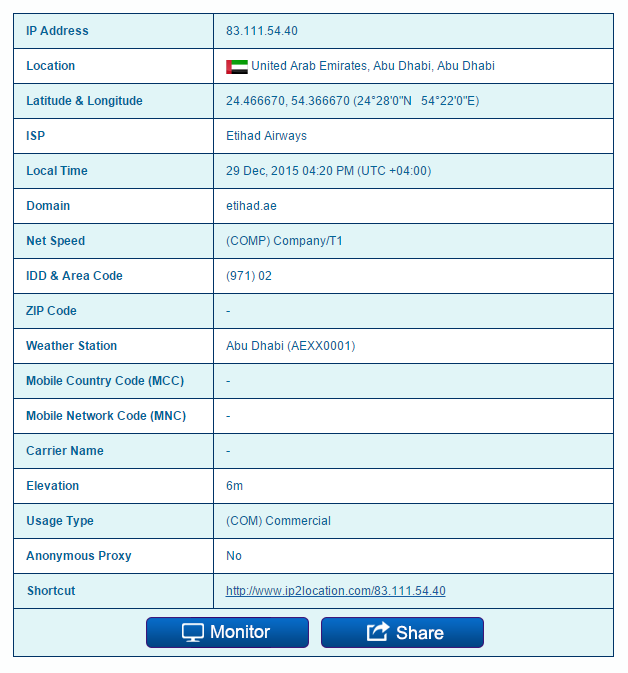 As evidenced above, the IP address belongs to the Etihad Airways headquarters in Abu Dhabi. Our suspicions proved correct and it became evident that Etihad had created a fake account under the username "MyWindowToTheWorld" to circumvent their account suspension , make their account suspension public (again, possibly to put fake public pressure on us to unsuspend it), while replying to their own customer pretending to be another customer in order to gain their sympathy while deceiving both them and us. There was a similar incident involving Delta Air Lines in 2007. We strongly condemn this type of unethical and deceitful behavior as it is the exact type of airline Customer Service culture our mission seeks to eradicate. It should be noted that Etihad was trying to assist their customer via this fake account, but it should also be noted that they had 6 days prior to their account suspension on December 29, 2015 to assist this particular customer via their official Etihad account here, but chose to ignore their customer until after their account was suspended for reasons that remain unclear to us. When we detect deceitful behavior from the airlines, we typically allow it to continue for some time before exposing it to make it significantly more damaging for the airlines. However, as Etihad had been engaging and assisting their customers on our site for 7 years, we decided to inform them immediately out of professional courtesy that we had caught them deceiving their customers and us, and they promptly stopped once they realized they had been caught. However, Etihad did not seem to appreciate our gesture of bringing this incident to their attention immediately as they quickly threatened us with having their legal team involved if we proceeded to publish this report of the incident. Unfortunately for Etihad, legal threats only encourage us to publish such reports and expose such unwarranted deceptive practices to set an example to ensure other airline don't even consider repeating the same mistakes. As such, we have made this thread a sticky so it stays permanently at the top of the Etihad Complaints section to warn all future visitors. Since this incident occurred (and as of today), we have yet to receive an apology from Etihad. Today we requested a formal apology from Etihad and will be posting it below if they decide to reply. It is unfortunate that after 7 years of engaging and assisting their customers on our site, rather than pay a nominal monthly fee to continue engaging with its customers, Etihad chose not to renew their account and preferred to deceive for free by circumventing their account suspension with a fake account. We expected better from Etihad.